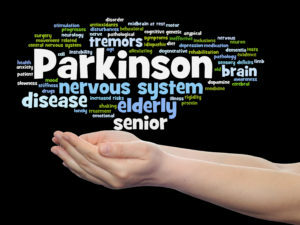 Parkinson’s is a progressive degenerative disorder of the central nervous system mainly affecting the motor system. People with Parkinson’s do not have enough of a brain chemical called dopamine. Without dopamine, all movement becomes slower. Early Parkinson’s symptoms may present as weakness, poor coordination and possibly a tremor in the hand or arm. This may often develop into stiffness in the muscles, balance may become affected and walking may change to a more shuffling style. Often posture is affected, people with Parkinson’s often have a stooped or flexed posture. Everyone’s Parkinson’s is different, and therefore everyone starts out with an individual assessment usually within the comfort of their own home. There they can discuss how Parkinson’s affects them and their lives. We then go through a physical assessment looking at their abilities and weaknesses. From there, the assessment is discussed and a plan of treatment is jointly set. This will often take the form of daily exercises, regular therapy input to maintain posture and walking and advice on managing their disease.